A child waits for U.S. Army soldiers to medivac her out of Port-au-Prince, Haiti, on Thursday. 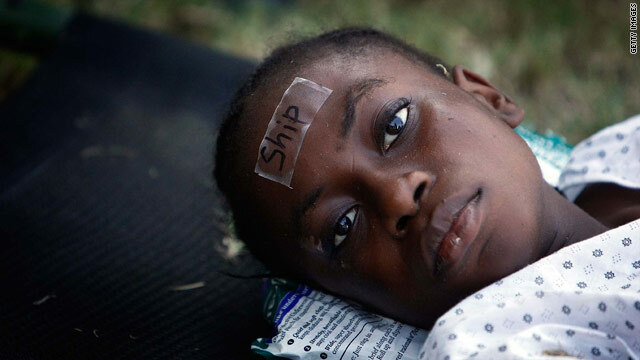 Watch Anderson Cooper live from Haiti at 10 p.m. ET tonight. 8:44 p.m. -- Haitian police shot and killed a man they suspected of stealing rice in Port-au-Prince on Thursday, leaving his body on the sidewalk for hours as his family mourned. Witnesses said no one was looting at the time. A nearby shop owner said the five bags of rice the men were found with fell from a truck and passers-by picked them up. 8:30 p.m. -- Haiti's orphanages have become targets for people desperate for food, water and medical supplies, aid workers said. On Wednesday night, Maison de Lumiere, an orphanage caring for 50 orphans, came under attack from a group of 20 armed men, aid workers told the Joint Council on International Children's Services. A neighboring orphanage sheltering about 135 children has been robbed several times over the past few days, they said. 6:20 p.m. -- U.S. medical assistance teams have treated 7,000 patients in Haiti, the White House said in a statement. A total of 160 U.S. missions have been flown carrying 2,600 tons of relief supplies and more than 2,500 military and relief personnel into Haiti, and will be delivering 50,000 hand held radios to Haitians, the statement said. The U.S. has also evacuated approximately 10,500 people from Haiti so far, including 8,300 American citizens, the White House said. 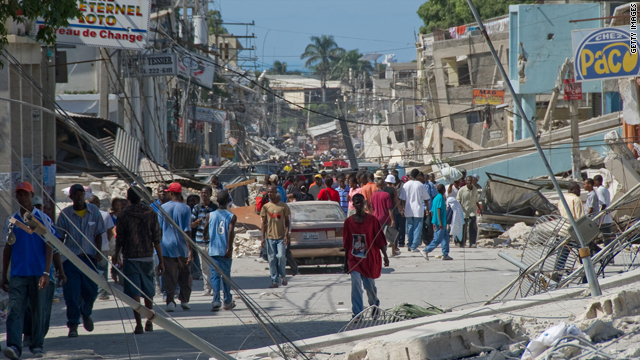 5:59 p.m. -- The Senate unanimously passed legislation Thursday that will allow taxpayers to deduct cash donations to Haiti earthquake relief on their 2009 tax returns instead of having to wait to file the claims next year. 4:37 p.m. -- Haitians are lining up in the streets for hours to try and receive wire transfers at the banks and wire services open in Haiti. Some Haitians said they haven't been able to eat because they don't have cash to buy any food available at street markets. 3:34 p.m. -- The U.S. Southern Command conducted an air drop of food and water over Haiti on Thursday. A C-17 delivered water and 17,200 meals ready to eat , the military said in a statement. Thursday's air drop was the second since the quake; the first was Monday. 1:06 p.m. -- Soldiers at the U.S. military base at Guantanamo Bay, Cuba, have set up tents, beds and toilets in anticipation of a possible influx of Haitian refugees, a military spokeswoman said. 12:55 p.m. -- A Dutch Navy ship, the Pelikaan, was docked at Port-au-Prince's south pier Thursday, unloading 90 tons of humanitarian aid. Two other ships previously offloaded containers. 12:29 p.m. -- The USGS confirms a magnitude 4.8 aftershock occurred nine minutes after the magnitude 4.9 at 11:45 a.m. and 15 miles closer to the capital. 12:14 p.m. -- Twitter users in the Port-au-Prince area report multiple small aftershocks. 11:45 a.m. -- An aftershock shook the capital. The U.S. Geological Survey estimated its magnitude at 4.9 and located its epicenter 30 miles west of Port-au-Prince. 11:10 a.m. -- Gen. Douglas Fraser, head of the U.S. Southern Command, said 63 military helicopters and 20 ships are working in and around Haiti. The military has distributed 1.4 million bottles of water, 700,000 meals and 22,000 pounds of medical supplies, he said. 10:52 a.m. -- One of two piers at the port serving the Haitian capital has reopened, and a gravel road was laid off of it, clearing a major route for aid to come into Port-au-Prince, officials said. 10:21 a.m. -- Save the Children, World Vision and a unit of the British Red Cross called Thursday for an immediate halt to any new adoptions of Haitian children after last week's earthquake, saying the focus must first be on tracing any family members the children may still have and reuniting them. 10:14 a.m. -- Louis Belanger of the charity Oxfam tweeted: "Water: all @oxfam sites are operational today. No logistical problems reported. Good day in #Haiti so far." 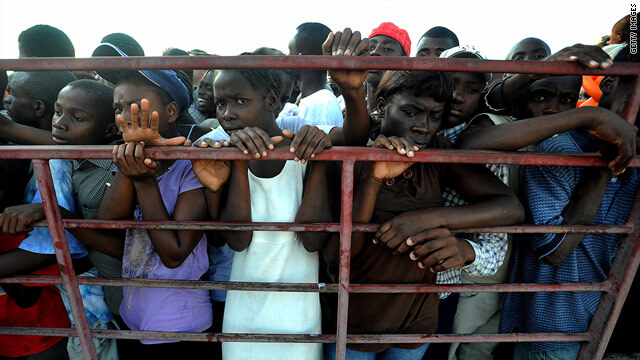 9:35 a.m. -- Haitians need donations of cash -- not clothes, food, medicine, or other relief supplies, as well intended as they might be, aid groups said Thursday. Such "in-kind" donations take up valuable space in cargo shipments and waste aid workers' time in sorting through the items, charities said. 9:19 a.m. -- The State Department says the campaign that allows mobile phone users to donate $10 to the Red Cross by texting "Haiti" to 90999 has surpassed $25 million, making it the largest mobile donation campaign to date. 8:18 a.m. -- About 100 aid flights are arriving daily at the Port-au-Prince airport, up from 25 a day just after the earthquake hit January 12, a senior administration official says. 8:13 a.m. -- Ice and bread began appearing on the streets of Port-au-Prince this morning, for sale next to flattened and buildings and piles of rubble. Street vendors have been selling goods for days, but mostly nonperishables like crackers and candy. CNN crews spotted loaves of bread Thursday that appeared homemade as well as men and women carrying small blocks of ice in plastic bags. 2:48 a.m. -- The U.S. military will now station aid officials in the Port-au-Prince airport control tower to assess the contents of each flight, to prioritize landings and ease the flow of aid. The military also will provide security for U.N. relief teams, which had not been able to operate at night without protection. 1:15 a.m. -- Any U.S. citizen who wants to leave Haiti on a U.S. military transport aircraft can do so simply by going to the airport and applying for voluntary departure at a State Department office placed on the tarmac. The service is available to U.S. citizens or anyone escorting a U.S. citizen who is a minor. 12:01 a.m. -- Electrical power was still out most places in Port-au-Prince, but traffic lights were functioning. Some banks, wire-transfer offices and a few stores reportedly were planning to reopen Thursday.